For many women, the time spent during their maternity leave is often the only period of their lives in which they can stay at home. Most families ultimately decide that it’s financially beneficial for moms to work outside the home after having children. After all, any additional income received by the household has to be good, right? However, the rising cost of daycare, which has shot up 70 percent from 1985 to 2011 according to the Census Bureau, has some couples questioning whether or not working, truly offsets the high price they pay for childcare. Think about it. If the cost between staying at home and going back to work aren’t drastically different, then when is it more beneficial to the child for a parent to stay home? While each have their advantages and disadvantages, it’s important to know which one is right for your family. Consider these factors, as you weigh the financial feasibility of continuing to work outside the home. Like with any financial decision, the best thing you can do is run all the numbers, and I do mean all. List the cost of absolutely everything you pay for and all your fixed expenses. Get an idea of what you pay for a mortgage, cars, utilities, and loans. Then list out all those expenses that vary, such as groceries, gas, entertainment, and any other cost that’s a staple in your life. Next, evaluate how much all those expenses take from your monthly incomes. Is it so much that you have very little left, or do you have enough of a surplus that you might be able to get by if you only had one income? Another aspect to consider is whether or not you have areas of your life and budget that you could stand to cut back on. If so, you might want to examine where you could do so, and if it could be enough to eliminate a full salary from your yearly income. For example, maybe you could cut your gym membership and workout at home, or switch your expensive cable for Hulu instead. There’s more costs to work life than childcare alone. While you should evaluate how much you spend on daycare each month, you should also consider all the other expenses working costs you. Depending on where you live and work, you may have to commute. Plus, even though some offices have become lax on this subject, you’ll still have to purchase clothes appropriate for the office. The cost of gas and wear and tear on your vehicle will no doubt cost you in the long-run, and while you might still purchase clothes for home, there’s no dress code. After all, business clothing isn’t usually cheap, and even with a sufficient wardrobe, chances are you’ll have to pay for dry cleaning. Lastly, working usually means more meals out. Whether you regularly grab lunch out during the workday, or are simply too tired after to cook, most working parents probably find themselves opting for takeout more than they might had they stayed home. 3. What About Your Savings? Before quitting your job, you might want to assess your financial goals and savings. It’s important to be able to save not only for an emergency, but to save for retirement or your child’s college education someday. Even if one salary is enough to cover your daily expenses, you should ask yourself if you can still adequately contribute to your savings accounts if you only have one income. Furthermore, one of your employers may have been matching any savings that you put into a 401(k) or IRA, which is why you’ll have to carefully consider whether or not you can, but if it’s financially feasible to live without that. While there are some financial goals you can wait on, there are others that you simply shouldn’t. Money isn’t the only aspect that should play into your decision. Think about the quality of life for you and your family both with a job and without. There are things like more time with your children, less stress due to a job, and the chance to potentially explore something new that all come with staying at home. That being said, if quitting your job means that you’ll have to be extremely frugal or put you under more stress due to financial reasons, then the payoff of staying home might not be worth it. After all, while you could always find ways to cut back, it shouldn’t come at the cost of taking all the joy out of life. One of the easiest ways of figuring out if you can survive on one income is to simply formulate a new budget and try living on it for a month. While this might not work if you absolutely need both incomes to pay all your bills, it’s an avenue worth trying if you find you have some left over. Sit down and list your monthly income with only one person’s salary. After which, you can start subtracting all your necessary expenses from that number and then find areas that you can cut back on, in order to make that one salary work each month. Then, go a full month sticking to that new budget. My advice would be to put your surplus into savings for the month so you’re not tempted to cheat. This way you can see if it’s a lifestyle you can handle. It’s a good way to practice before you make a major decision. Should You Go Back to Work Outside the Home? Deciding to stay at home is a decision that’s unique both personally and financially to you and your family. And while there are many factors to consider with costs, only you can decide what works for you and whether or not staying at home is a viable option. At the end of the day, if you’d rather stay at home and find yourself paying an exorbitant amount on childcare, it’s worth running the numbers and practicing a one-income lifestyle to decide if the cost of childcare is truly worth your time outside the home. 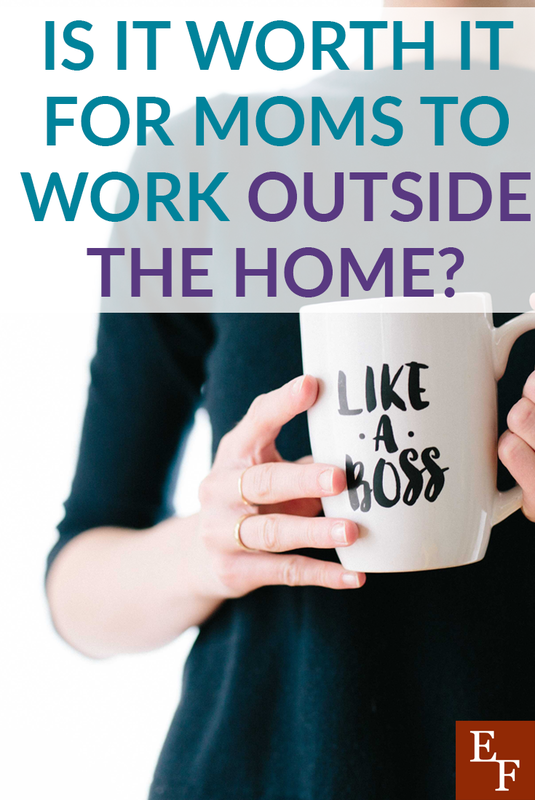 Have you considered becoming a stay-at-home mom, or did you go back to work outside the home? Also, I have been trying to get some help with this, Do pacific beach condos hold their value? the reason I want to know is mainly because of work, I have been very interesting about real estate lately.